One of the members of my Wednesday night gaming group is woefully uneducated when it comes to movies. It is straight up embarrassing and it is a wonder we tolerate him at all because of it. So many great references are completely lost on him. We took it upon ourselves to fix the poor boy by forcing him to watch the greats, and the Ghostbusters franchise topped the list. Ghostbusters is no stranger to the IP-driven board game market by any means, but the recent card game offering from Renegade Game Studios is pretty darned fantastic. A bunch of 30-year-olds (plus the young buck in his 20s that hasn’t seen a single good movie ever) had an absolute blast playing this game which has an age rating of 8+. Here’s why this small box tabletop game is a standout in our books. The first thing that absolutely has to be lauded about this game is the art. Holy wow, did illustrators Jacqui Davis and Todd Bright do a fantastic job of translating the first two movies into 100% kid friendly and appealing art. 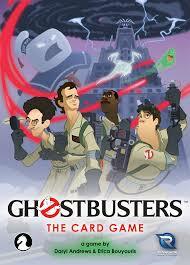 Apart from the Ghostbusters themselves, the cards also feature various recognizable ghosts from the franchise. We’d flip over the ghost cards for the round and spend a couple of minutes nostalgically recalling the ghouls we’d revealed; from the major villains like Gozer, Viggo, and the Stay Puft Marshmallow Man right on down to bit characters like the Ghost Jogger, Ghost Train, and even the Dream Ghost (yeah…that one). 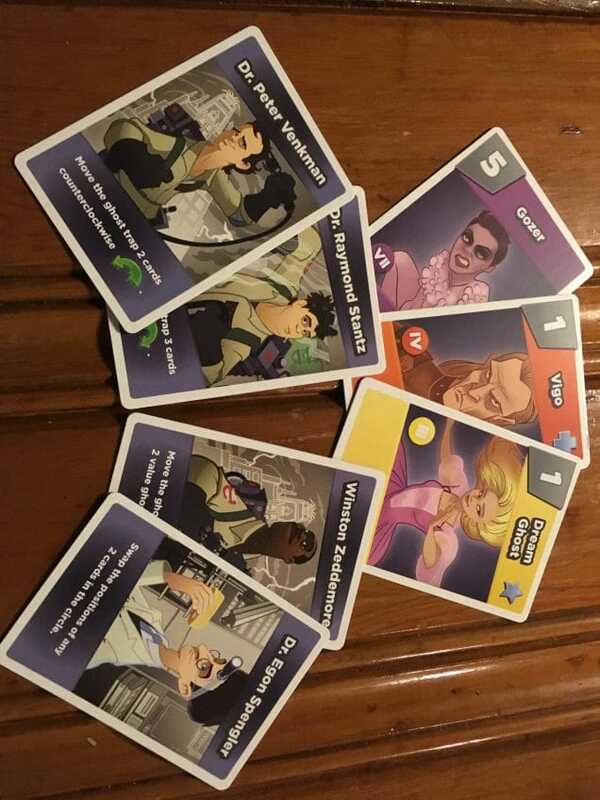 For fans of the franchise, there is enjoyment to be had even apart from the gameplay by just flipping through the cards and recalling gags and battles from the movies! The gameplay itself is super, super simple. On your turn, you play cards from your hand to move a Ghost Trap around a circle of ghoulies. You catch the one you finish your turn on and set it aside for scoring purposes at game end. Each ghost has a value at the top left and many have a shape at the top right. You add up your values, any runs you managed (think a straight in Poker, but with the Class ranking of the ghosts), and get extra points if you caught the most ghosts with a certain shape. You might lose a few points if you caught the most slimy ghosts and do not also have Slimer – who turns slimy ghosts into extra points! There are also gear cards that are worth increasing amounts of points depending on how many you managed to pick up during the game’s three rounds. There are a few extra abilities on some of the ghost cards that you can use once they’re captured, but apart from that it really couldn’t be more simple. And I actually love that the game is designed so as to include a younger audience. Some light addition, shape recognition, matching, and even a wee-bit of Roman numeral identification (the Class of the ghosts) gives this game some learning potential! A dash of luck and a bit of strategy keep this game from bogging down at any time without sacrificing the fun factor for the players. It isn’t a heavy, complex game, but you’ll have to use your noggin’ to make the best play when your turn comes ’round. You’re limited by the cards in your hand, and the order you play them in matters! Like I said: A dash of luck (on the draw) and a bit of strategy (in their play and what ghost within range makes for your best play). 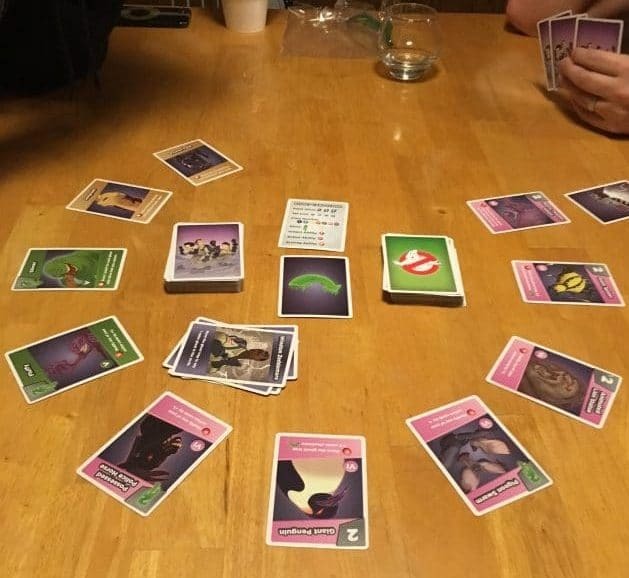 While I don’t think Ghostbusters: The Card Game will replace any game night favorites for most adults, it is a good “brain break” from the likes of the heavier games we know and love! And if you’ve got kids, this might well be a staple of your game night rotation. Very accessible, no fright factor to it whatsoever, and even a few teaching opportunities throughout. 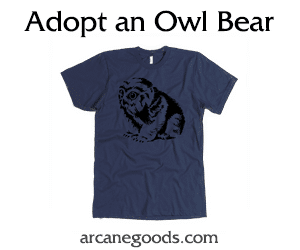 It’ll make an appearance at my gaming night from time to time, and it will 100% be featured at the next tabletop night I hold for my students (ages 11-18). But it will be lead and loved by one of us 30-somethings even then! You can snag Ghostbusters: The Card Game from Renegade Game Studios for about $20. And if you won’t pay it, we can just put the ghosts right back! Disclaimer: Nerds on Earth was provided a copy of Ghostbusters: The Card Game by Renegade Game Studios in exchange for an honest review.